I would like to express my GRATITUDE for having had the opportunity to partner with celebrity stylist - Christos Garkinos - of Bravo’s Dukes of Melrose and Jessica Raiter, the style director of 11 Honoré. When 11 Honoré and Christos asked me to collaborate and invite my friends and followers to join me on Friday, May 11th for a size-inclusive fashion pop-up at the Detroit Foundation Hotel, I was THRILLED. After laying my eyes on the site and brand, I was hooked and so excited to host this shopping experience and bring awareness to the groundbreaking, fashion revolution behind 11 Honoré. Pictured above, you can find FashionLayn, Curls and Contours, With Wonder and Whimsy. Although 70% of U.S. women are a size 14 or higher, many high-end brands stop sizing at a size 12. There has always been a need to address this issue; however, this need has gone unaddressed - until now. There are so many women, who like myself, have a love affair with fashion but have felt unacknowledged by some of their favorite brands. That is why I was so excited to partner with this brand and expose it to the metro Detroit area. 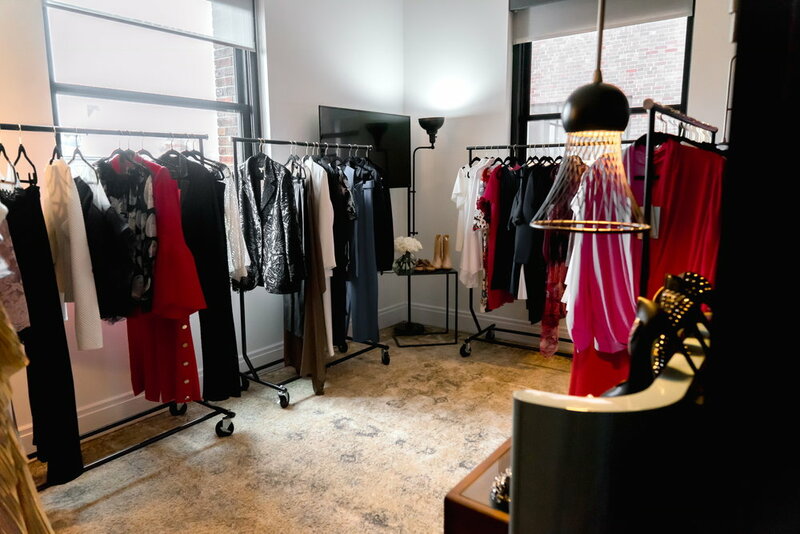 The high-end fashion pop up was held in the penthouse suite of the Detroit Foundation Hotel. The event was about shopping high-end fashion, but it was also an empowering display of the many shapes of beauty. The clothing among the 11 Honoré spring collection featured designers such as Marchesa, Zac Posen, Baja East, Dima Ayad, Christian Siriano, TOME and Prabal Gurung. 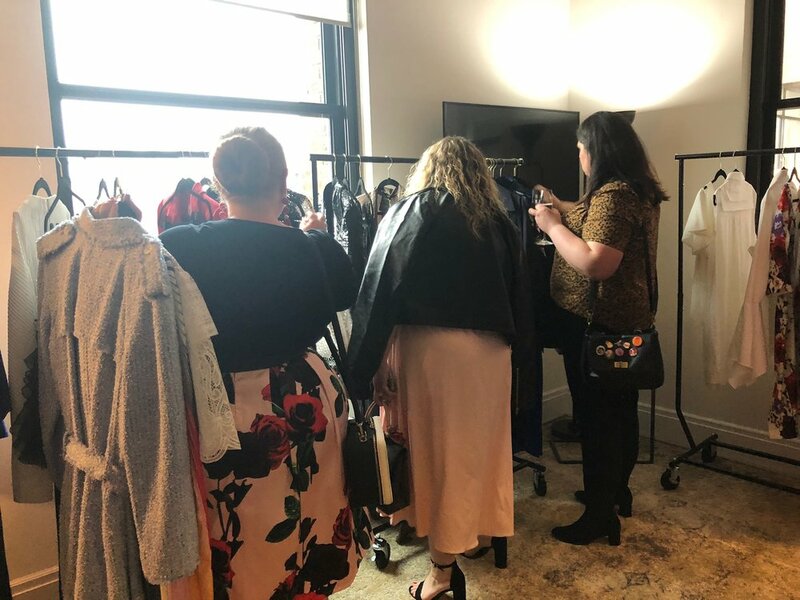 There were over 100 curated pieces for women to shop from, offering a variety of clothing to fit different body types. 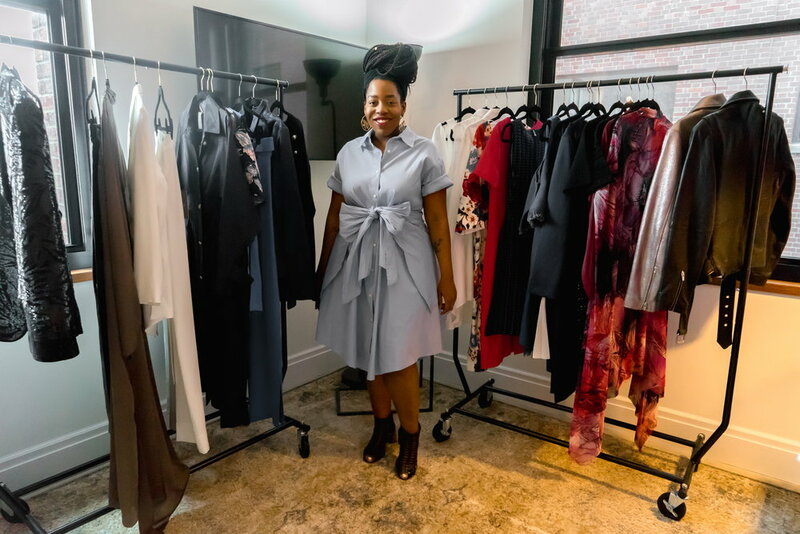 All the clothing curated by 11 Honoré to showcase the sites spring collection was absolutely stunning; however, I had no idea of the inspiring transformations that would take place once the women in the room put the clothing on. Can you say GLOW UP? The penthouse suite was literally transformed into a showcase of GIRL POWER and UNITY. It was so inspiring for the women in the room to be uplifted and boosted with confidence that immediately took over just by putting on the clothing. Although the clothes on the hangers we’re absolutely stunning, it was the women wearing them that brought the apparel to life. I'm fully dressed head to toe in Baja East and one of my faves - Leah Vernon of Beauty and the Muse is in Christian Siriano evening coat and Dima Ayad gold turban. Hats off to 11 Honoré for changing the fashion game and addressing the full scope of women across the U.S. But, most importantly hats off to the women who attended and to ALL WOMEN who continue to empower one another and embrace the diverse shapes and sizes that make us all uniquely beautiful.